Things have gone from bad to worse for the Opportunity rover now that it’s caught up in a massive Mars dust storm. In an update, NASA revealed that Opportunity didn’t respond to a contact attempt. The team now assumes the robotic explorer’s batteries have reached a critically low level, and that it’s currently in a low power fault mode that shuts off everything but the mission clock. Outside of waking up to check power levels, the rover will stay in this mode unless its solar panels can restore enough energy. The problem, as you might guess, is that this isn’t a small dust storm. It covers roughly a quarter of Mars. You might have to wait a long while before there’s a chance of resuming contact with Opportunity, and that’s assuming the rover hasn’t been damaged. Don’t give up hope, though. 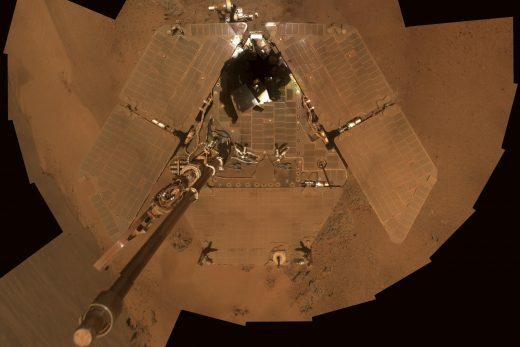 The rover managed to survive a fierce storm in 2007 — it doesn’t give up that easily.